If you’ve ever seen the movie “Ratatouille,” you may recall that Remy the Rat could see flavors in color. I do this with seasons. Winter is burnt umber and ivory, the colors of deep sauces and stored roots. Summer, on the other hand, is a carnival riot: Reds and oranges and purples and vibrance all around. It’s a crazy-quilt of color. Spring is easier. Spring is all about spring green — that vivid, bright emerald that always has a yellow cast to it. This is the green of new growth. Yellow, the canary of mustard flowers and the school-bus yellow of dandelion flowers, compliment that green. So each year I try to design a dish that celebrates those colors. Some are baroque, others loaded with esoteric ingredients. This recipe is neither. 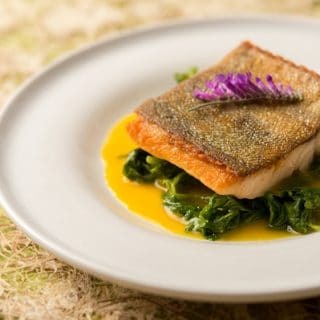 It’s a simple piece of fish, with simply cooked greens, served with a sauce to easy to make you will wonder you have not made it before. Why orange and saffron? It’s a combination that works. Trout has some fat in it, so you will want a bit of acid to balance it. Thus the white wine and orange juice. Orange adds some sweet, butter smooths it all out, and the saffron, which has a complex, dried hay-like aroma and an ever-so-slightly bitter flavor, makes everything intriguing. No great story here, although the catching of the trout on Pyramid Lake was pretty cool, and the greens are an unusual variety of amaranth I grow in my garden (spinach would be a good alternative). This is just a great, simple dish you can actually whip up on a weeknight. Really. It only looks fancy. This dish is pretty simple, although it looks fancy-dancy. 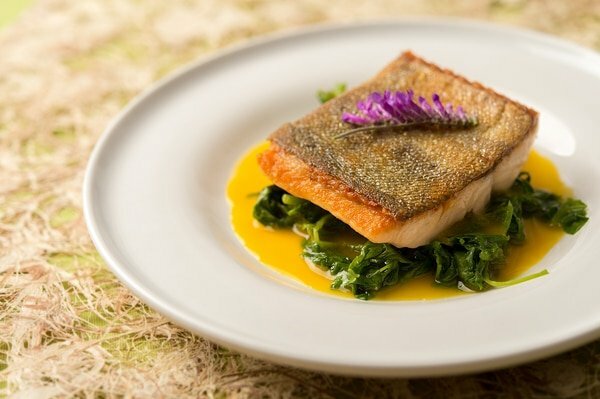 It's simply seared fish, a very simple sauce, and greens cooked in butter. Once you make this recipe a second or third time, it will come together in less than 30 minutes and will impress your friends. Make the sauce by bringing the white wine, orange juice, saffron, sugar and shallot to a boil in a small pot. Simmer strongly for 5 minutes, then turn off the heat and puree the sauce in a blender. Return it to the pot and turn the heat to low. Add salt to taste and keep warm, but don't boil it. Cook in the greens in 2 tablespoons of butter or oil over high heat in a large saute pan, stirring constantly until they wilt. Add the splash of water, the orange zest and some salt and cover the pot. Lower the heat to medium-low and steam the greens for 2 minutes. Turn off the heat. Sear the fish by heating the remaining butter in a pan large enough to hold the fish -- if you don't have such a pan, put a baking sheet in the oven and set the oven to 200°F so you can keep the fish warm as you do this in batches. Heat the butter over high heat until it stops frothing. Pat the fish dry with paper towels and set it skin-side down in the hot butter. 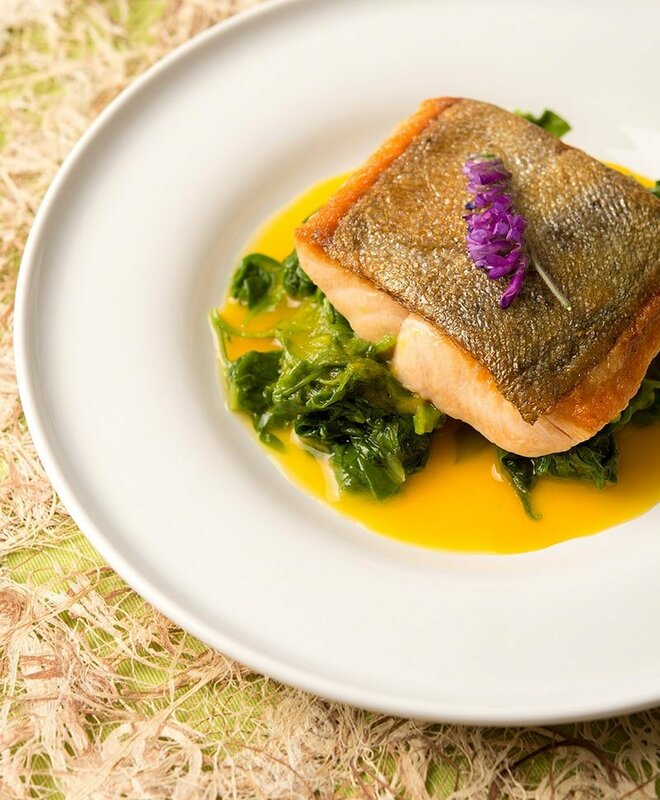 Turn the heat down to medium-high for a typical trout fillet (like you see in the picture) or to medium if you are working with a thicker piece of fish. Let the fish cook undisturbed for 2 minutes, then use a large spoon to baste the meat side of the fish with the hot butter. Do this constantly for 90 seconds, then give it a rest. Thin pieces of trout will only need this quick basting to cook through, but thicker pieces of fish will need a second or even third round of basting. When you are done basting, salt the meat side. The skin side should lift off the pan easily after about 4 to 5 minutes of steady cooking. The moment you take the fish off the heat, salt the skin side. To serve, swirl in the remaining 2 tablespoons of butter into the sauce, one tablespoon at a time. Pour some sauce on everyone's plate. Top with the greens and then with a piece of fish. Serve at once. A word on the fish. I like this with trout, which is mild and a little fatty. But you could use salmon, or any fish where you would eat the skin. Hate fish skin? Shame on you, it's crispy-yummy! But no matter. You can do this with skinless pieces of fish, too. I used this recipe with our recently caught Lake Trout from Lake Michigan and it was delicious! Our fish was pretty thick therefore it took a lot longer to cook.